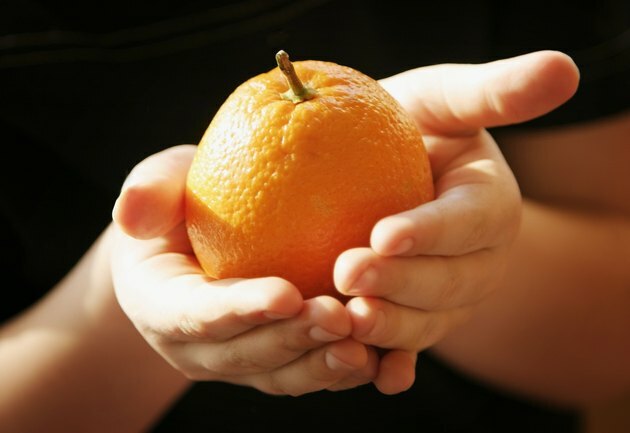 Orange oil is an essential oil derived from the glands of the orange peel. Pale to dark orange in color, it has a strong, fragrant aroma that is uplifting to the senses. Orange oil may be used in cooking and baking or as a treatment in alternative medicine. Alternative medicine practitioners often use orange oil as an anti-inflammatory, antidepressant and as a sedative. You can prepare orange oil at home for your own personal use. Peel the skin of 20 large oranges. Put the skins in a bowl, and set them aside to dry for two hours. Process the orange skins in a food processor until they become a very dry paste, which will usually take about five minutes. Put the grounded orange peels into a Mason jar. Add 1 cup of vodka, or enough to cover the skins. Cover the jar with a lid. Put the jar in a sunny area of your house, and leave it there for about three days. Shake the jar at least twice a day. Put on kitchen gloves. Open the Mason jar, and strain the mixture with a strainer. Throw away the orange peels. Pour the mixture into a shallow bowl, and allow the alcohol to evaporate, which will take about 12 hours. You should end up with about 1 ounce of orange oil. Store the orange oil in a small amber bottle and use as needed. You will only need a few drops of orange oil when using as a flavoring in baking or cooking. Use orange oil as a natural cleaner by adding a few drops to soapy water. Orange oil may irritate your skin. Put on kitchen gloves when preparing the oil, and refrain from getting the oil into your eyes or any open wounds.